Teething puppies can be relentless. They’re uncomfortable and so little that they don’t really know what’s going on. One way to help make them feel better is to find the right teething toy. To help you find the best chew toys for teething puppies, we researched a range of new and bestselling products. The result? Our top ten list of toys that will make your puppy feel a little bit better. Let’s look at what you need to know when shopping. Count: Some of our top picks are a single toy. On the other hand, some are large sets that contain a variety of up to 12 different toys! Some are all rope toys, some are a mix. Size: Because these toys are meant for puppies, most of them are small. None of them should be used with large adult dogs. Some of the sets that include multiple toys have a variety of sizes and can grow with your pup. 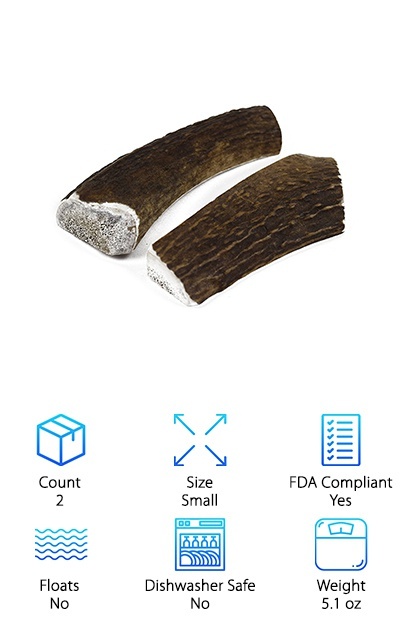 FDA Compliant: When it comes to chew toys, the only place FDA compliance matters is with something natural like an elk antler. They follow the same guidelines as foods. The FDA doesn’t have any guidelines for cotton or rubber toys. Floats: Using a puppy toy in a pool or at the beach is a great way to get your puppy started swimming. If it floats, it’s a good thing to use to lure him into the water and make him feel comfortable. Dishwasher Safe: While most of the cotton ropes we reviewed are dishwasher safe, the rubber toys can usually be put in the dishwasher. Remember, use a hot cycle with no detergent! Check manufacturer recommendations for your toy. Weight: Weight matters because puppies are little and can’t carry around heavy toys. For the large variety packs, we weren’t able to list a weight - there were just too many toys! But each one has a lot of puppy friendly sizes. Now that you know how to choose the best puppy teething toys, we’re ready to jump into our reviews. We’ve arranged them with our top pick and budget pick listed first. This way, if you’re in a hurry, you can make sure to check those ones out first. The products that round out the rest of our list are definitely worth a look, too! All right, let’s get on with our reviews of the best chew toys for puppies! There are so many great things about these elk antlers, we almost don’t know where to begin. First of all, Jim Hodges elk antlers are larger and heavier than most of the others on the market. That’s not all. They’ll also last a lot longer than other kinds of dog toys. Your puppy can chew and chew and chew, satisfying that natural instinct without ruining your shoes or furniture. They’re not sticky or greasy and they’re great for tartar control. And that’s not all. They’re made from naturally shed elk antlers. That’s right. No harm comes to the elk, they harvest them right off the forest floor. And get this: they’re also a good source of calcium, phosphorous, manganese, and zinc! One more thing: they’re available in different sizes, too! If you have a puppy who loves to chew on your shoes and thought about just getting her a pair of her own shoes to ruin, we have the next best thing. 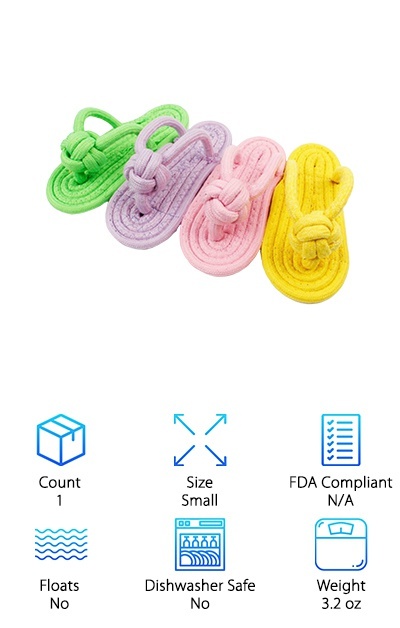 These HooPet Chew Toys are made of tough, spun rope that’s twisted and shaped into a flip-flop. That’s right. Your puppy can have their own chew to nosh on and yours will remain dry and intact. Hopefully. They’re only about 6” long so they’re the perfect size for your pup. The material is 100% natural cotton fibers and is durable enough to play fetch with. That’s not all. It even acts as dental floss as your puppy chews it, cleaning and flossing your pet’s teeth as they play. These are perfect for puppies and small dogs up to 20 lbs! 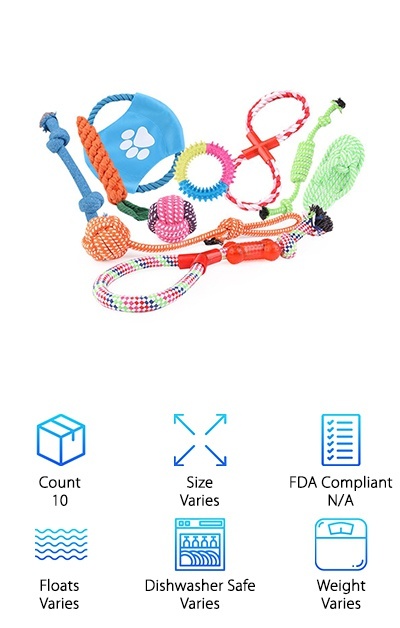 If you’re looking for the best toys for teething puppies, you will definitely find what you’re looking for with this set. Why? There are 12 different toys here. You read that right. 12 toys. And that’s not all. There are all kinds of different toys, too. They’re made of various kinds of rope including cotton and nylon. You’ll find a rope ball, rope tug toys, and even a bone made of rope. Some of them have rubber bone accents on them, too, so your dog can enjoy different textures. There’s even a flying disc! These toys are designed with materials that fight plaque build-up and can help prevent gum disease. And one more thing: you get a reusable bag for easy storage and transport. Perfect for going to the dog park. The size variations in this set are pretty impressive! There are some great puppy toys here but this set can grow with your dog. Each toy (with one exception) is a different kind of rope toy but they’re all so different. The longest toy in the set is a 20” long tug rope that you can use to play one on one with your pup. The smallest is a 3” wide tightly wound rope ball. You also get a flying disc, figure 8 tug toy, and knotted ropes of various thicknesses, materials, and colors. There are 8 toys in all. Each is made out of non-toxic material. And guess what else? They help clean teeth and gums, too. They’re backed by a 100% guarantee. If you’re not completely happy, you get your money back. This set comes with some pretty awesome toys and has a good variety of materials, too. Here’s what you get: a rope flying disc, a rubber bouncy ball, a rubber bone, a squeak toy with cleaning and stimulating bristles, and a rubber bone with a tug rope. Now, you might be wondering why there are only 5 toys mentioned when this set comes with 6. That’s because the last part of this set is a dog bed! Yes, a dog bed that’s made of safe, durable, non-toxic materials. The dog bed is a circle about 23” across. Not big enough for a larger dog but it’s the perfect size for your puppy. These are some of the best teething toys for puppies because of the variety. Play with your dog or let her play solo! Here’s a great set of rope toys made of machine washable 100% natural cotton fiber. They’re strong, hard, and durable. That’s why we’re calling them our best chew toys for lab puppies. They’re tough enough to stand the gnawing of a larger, aggressive breed. One of the benefits of rope chew toys is that they clean your pup’s teeth while he plays, reducing plaque buildup and helping to prevent gum disease. 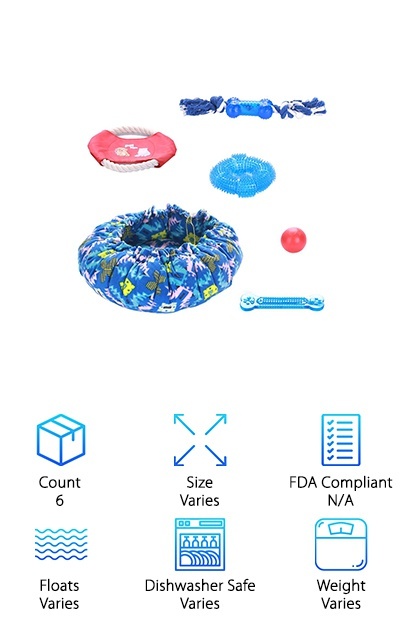 This set comes with toys that allow your puppy to play on her own and some that let you play together. Both of these activities are important! You need to bond with your puppy and she needs to learn how to cope on her own when you’re not home. This is a great set to help you use to play as a way to train and bond. 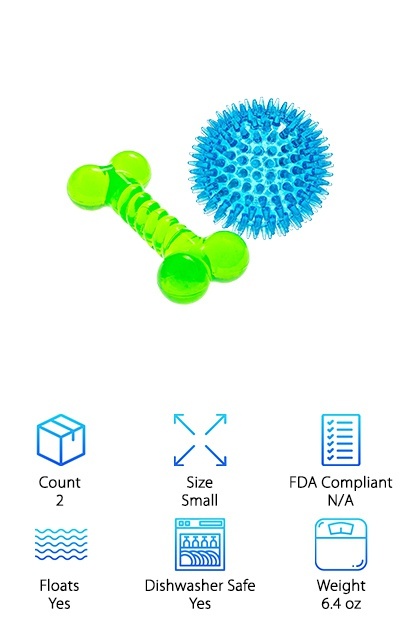 This set includes a bright green bone shaped toy and a blue ball with large bristles. Both are made of high quality, extremely tough rubber. These toys last a long time, which is one reason they’re so great for puppies. They can grow up with them! And guess what else? They’re a great choice for aggressive chewers. Your puppy can get rough and they’ll still keep their shape and stay together. There’s no such thing as an indestructible toy and chances are your puppy will prove that to you over and over again as she grows up. But these toys are pretty tough. The bright colors are great, too. They really make them easy to find if you’re playing fetch and one accidentally goes missing. Another great thing? Well, for your sanity, anyway. These don’t squeak. This is another set that’s perfect for your puppy but great for small breeds as they grow up, too. With 4 toys to choose from, you can give them to him all at once or dole them out one by one as he gets older. 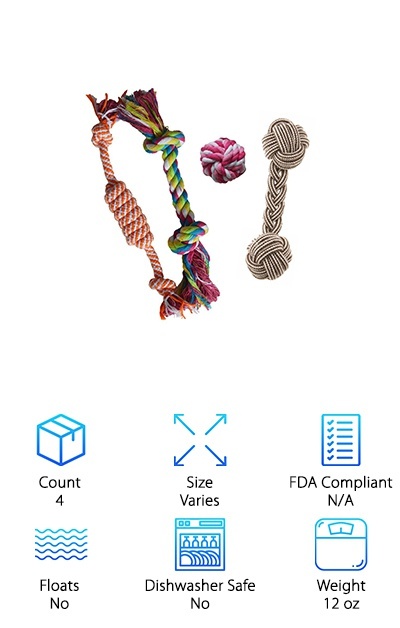 This set includes 4 various rope toys. You get a rope ball that you’ll never have to worry about deflating, 1 rope chew toy, and 2 different rope tug toys. Your pup can chew to his heart’s content or you can get in on the action and play fetch or tug of war. These toys are 100% cotton. This is great for a few reasons. It’s all natural and will help clean your pup’s teeth as he chews. Plus, you can throw them in the washing machine when they get dirty. For a set of high-quality toys that will keep your puppy entertained for hours, check out this set from Youngever. 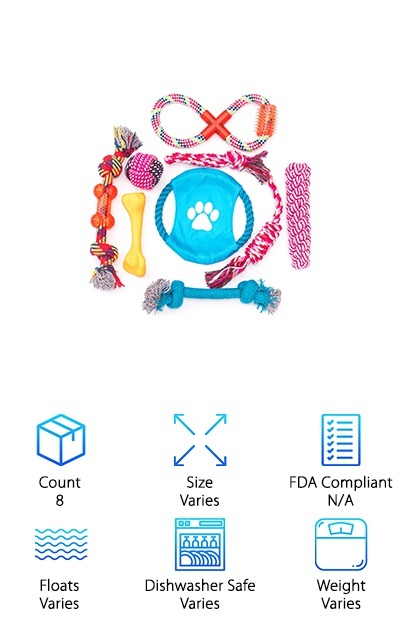 There’s a great variety here, including things your puppy can play with on her own and a few that you can use to play together. First, you get a 100% rubber bouncing ball, ring, and teething bone. These are dishwasher safe (with no detergent!) and they float. They’re great for using as a way to help your pup get started in the water. 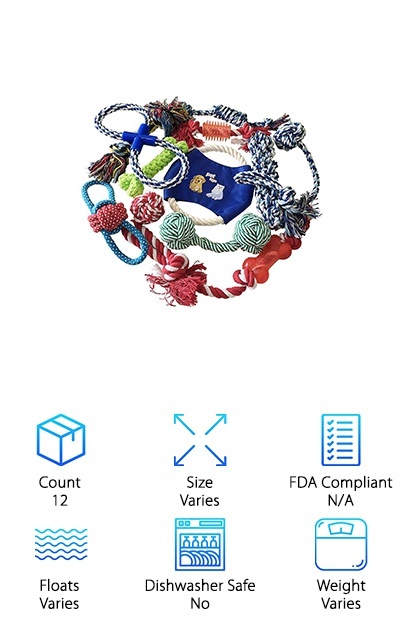 You also get 5 floss rope toys. These vary from a rope ball that will never deflate to tug toys of different lengths. As we’ve mentioned, rope toys are great for cleaning teeth and stimulating gums. There’s another reason to try these toys - they come with a 100% money back guarantee. KONG is a really popular brand that makes some pretty great stuff for dogs. This puppy tire is perfect not only for teething. It’s also a great way to begin training. Why do we say that? Because it has an inner rim where you can stick treats. 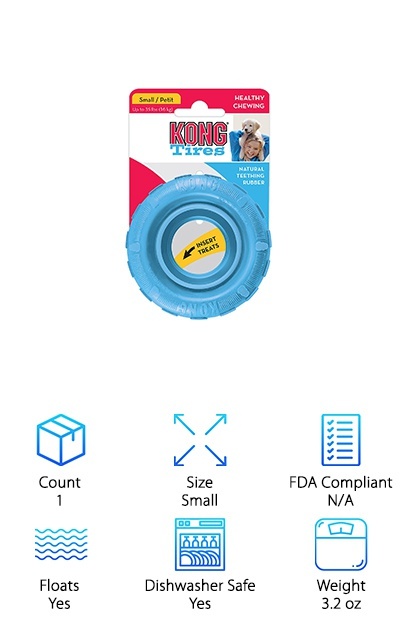 KONG makes their own that will fit well or you can use your puppy’s favorite. You can even just smear some peanut butter in it! There are more benefits to giving your puppy treats this way, too. Trying to work out how to get the treat out of the tire is a mental challenge for your dog, too. One with a tasty reward. The rubber is specially designed for teething puppies and designed to ease their sore gums. You can even freeze it to give your pup a little more comfort.